conveying equipment that is not ideally suited to address the needs of their particular food processing and packaging applications. One industry that is heavily dependent on the use of conveying systems is breakfast cereal manufacturing, where a variety of different conveyor applications, with varying levels of efficiency, have traditionally been utilized to transport cereal products between sequences of processes. Breakfast cereal processing plants are beset with several critical conveying challenges. One of the most important is ensuring that the finished product, once it has gone through its various processing steps, emerges undamaged before its final packaging. Keeping the clusters, loops, puffs and flakes whole can be a significant challenge, however, given that at the end of most machine processing steps the product falls, it is dropped down onto a conveyor system before being taken to the next process. The idea is to get that product through the processes and into the packaging as gently as possible to avoid breakage. Breakfast cereal plant managers and plant engineers know that how their product is conveyed during the entire manufacturing process plays an important role in ensuring minimum waste as raw goods are transformed into finished cereal products ready for packaging. Product contamination is another key issue influencing conveying in breakfast cereal production. In every step of the process, from receipt of raw materials through packaging, precluding any foreign matter from entering the process stream is a critical objective. Traditionally used in cereal processing, bucket elevators and belt conveyors, having an open profile, not only permit the entry of cereal dust and foreign particles into the food stream, but they promulgate and spread dust because of their exposed format. This opens the door to contamination and unwanted spread of allergens. This problem is particularly evident during product transfer between the coating, drying and packaging operations, where there is exposure to a combination of different ingredients. The importance of the product contamination issue is magnified with increasingly stringent governmental and industry mandates, and consumer demands for maintaining product integrity and safety. Line changeovers have become a focal issue in breakfast cereal plants relative to both cleanliness and speed of changeovers. Companies are trending more and more wanting to run different product lines within a shift or day. Despite these changeovers, processing plants are expected to maintain stringent levels of sanitary operation. This can be a time-consuming challenge when cleaning conveying systems. Bucket elevators and belt conveyors are particularly notorious for requiring significant time for cleaning because of their various interlocking components. Every minute spent disassembling a conveyor system for cleaning consumes valuable production time. Yet, if not cleaned properly, that batch of cereal that needs to be discarded in-process because of contamination is lost profit. Or worse, consumers could be negatively impacted, resulting in potential injury, costly recalls and impacted brand reputation. To resolve these issues, cereal processors are charged with administering changeovers as quickly as possible while maintaining 100 percent system cleanliness. Flat-Belt Conveyors – Although this type of conveyor can handle cereal products gently, the product is exposed to ambient contamination, unless covered. The cover, however, collects cereal residue and must be removed and cleaned between runs to reduce the risk of cross contamination, a usually tedious task. The cereal product when introduced onto the conveyor is typically dropped from the processing machine, which produces dust and at that point can cause product damage. Bucket Elevators – Bucket elevators use a continuous line of buckets, either attached to each other on a rubber belt, or attached by pins to two endless chains running over tracks and driven by sprockets. Centrifugal force throws the cereal out of the buckets into a discharge spout as the buckets pass. This type of conveyor can transport fragile materials with minimized product damage. But the system can be very dusty, as dust is generated when cereal is loaded into the buckets and while the product is being conveyed, resulting in residue build-up which can cause cross-contamination. The excessive dust produced can also open the door for dust explosions. Pneumatic Conveyors – These systems use air to move cereal from extruder to packaging, by generating air pressure levels that are either above or below the atmospheric pressure. There are two main types of pneumatic conveyors: the dilute phase conveyor and the dense phase conveyor, which differ by rate of speed and pressure. 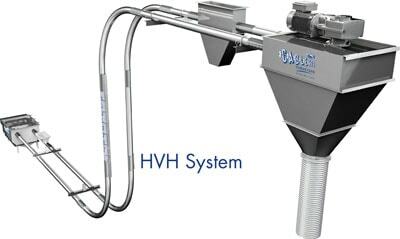 Both of these systems can be set up as a pressure or vacuum system. Pneumatic conveyors enable flexibility, allowing them to reach many multiple destinations with one system. They are also able to convey cereal at very high rates with minimal product breakage and dust dissemination (Dust is accumulated in filters). Cereal can endure breakage using this type of system depending on the sweeps and discharges. One of the main problems with pneumatic conveyors is their high power consumption. Pneumatic conveying is the most expensive method for moving cereals. Auger Conveyors – Known as flexible screw conveyors, they can transport cereals vertically, horizontally and at any angle. They consist of a stainless steel flexible screw enclosed in a rigid steel tube or flexible plastic tube driven by a motor. The enclosed tube rotates around a central shaft, transporting the cereal according to the screw design and rotational direction. When the breakfast cereal reaches the end of the tube it is discharged into the process machine or container for packaging. These conveyors have a throughput of up to 100,000 pounds per hour. Auger conveyors, however, have limitations on how much product they can transport before effecting product breakage, which can be significant. Also, internal cleanliness can be an issue resulting in a cross contamination risk, and the need to disassemble the unit on a regular basis for cleaning. Aeromechanical Conveyors – A completely enclosed, high-capacity mechanical conveyor that can move breakfast cereal vertically and at varying angles. Within a stainless steel tube, a wire rope with evenly spaced discs travels at high speeds, running in sprockets at each end of the conveyor. The high-speed action generates an internal air stream traveling at the same high velocity as the discs. As the cereal is fed in, the air stream aerates, or fluidizes it, and carries it to the packaging outlet, where it is discharged by centrifugal force. The system can move up to 80,000 pounds per hour of cereal A drawback to this system is that the flow of product can easily become inhibited, causing the conveyor to run without transporting cereal at expected throughput volumes. Downtime is also a factor because the tension on the wire rope needs to be adjusted at regular intervals. Tubular Drag Chain Conveyor –This conveyor gently moves breakfast cereal through a sealed tube with a drag chain pulled through it on a loop. Solid circular discs (flights) are attached to the chain, which push the cereal through the tube. This system can move up to 45,000 pounds per hour throughput of cereal. One of the drawbacks to this system is the tendency of the chain to accumulate cereal debris build-up, which poses a cross-contamination risk. Such traditional conveying systems have only minimally kept pace with the increasingly challenging requirements that breakfast cereal processors are facing. Not to mention corporations’ continued push for more cost-efficiency and higher throughput on their processing lines, which is also driving the need for system upgrades in breakfast cereal processing worldwide. Conveying systems that were installed in breakfast cereal processing plants 10 or 15 years ago incorporating the above systems, at that time may have been adequate, but now better technology in conveying system design, controls and automation has brought into place a whole new generation of conveyors for use in this industry, with resultant vastly improved efficiency. Safer, cleaner processes that reduce waste and deliver cost, labor and energy savings are increasingly being factored into equipment selection. Such conveying systems are having a critical impact on cereal processors’ operational costs and plant ROI. Embodying these requirements, the tubular drag cable conveyor, developed by Cablevey Conveyors, is fast becoming the system of choice for product movement through all phases of breakfast cereal production. The system gently moves friable cereals through an enclosed tube without the use of air. This latest generation of tubular drag cable conveyors can transport up to 49,000 pounds of breakfast cereal product per hour, at low speed, and with product degradation practically eliminated. Tubular drag cable conveyors gently move product through a sealed tube, using a patented, coated, flexible stainless steel drag cable pulled through on a loop. Solid circular discs (flights) are attached to the cable, which push the cereal through the tube. The coated cable ensures that no debris accumulates within the strands of the cable, as the cable is totally sealed. Designed for quick cleaning, quick line changeovers and maximized system uptime, the tubular drag cable conveyor system employs sophisticated cleaning mechanisms to reduce debris build-up. The flexible design of this completely enclosed system keeps contamination out, while enabling it to be cleaned-in-place at multiple points from cereal build-up. For example, an air knife at the product discharge locations in the system automatically releases food particles from the discs and cable. Also, urethane wiper discs attached to the cable eliminate any residual debris from the conveyor system while in progress. To increase uptime, the system is equipped with a cable self-tensioning device, as different from other conveying methods which require continual adjustments to their mechanical operating systems. The tubular drag cable conveyor operates on low horsepower, utilizing energy-efficient variable-speed motors of 5 HP or less, effectively consuming minimal power compared to other conveyor systems utilized in breakfast cereal manufacturing. The system’s production flow can be adjusted to variable speeds. 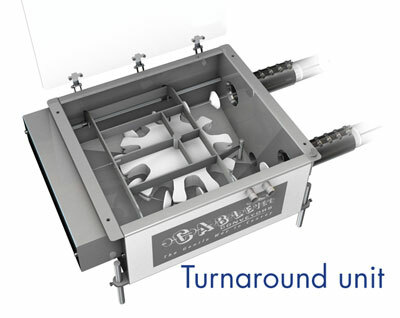 This tubular drag conveyor system has the unique flexibility to integrate with any processes in cereal production, for the manufacture of flaked cereals, extruded flaked cereals, gun-puffed whole grains, extruded gun-puffed cereals, oven-puffed cereals, shredded whole grains, extruded shredded cereals, and granola cereals. The conveyor is capable of being integrated into all processing areas, such as receipt, weighing and mixing of raw materials; preconditioning and extrusion; drying, tempering, flaking and toasting; and coating, drying, cooling and packaging. Tubular drag conveyors are ideal systems for moving product between extrusion, forming, tempering, flaking and toasting process, and on through to the coating process. “More and more breakfast cereal processors are looking at using this tubular drag conveyor technology right from the initial mixing phase to the blender, then into an extruder,” continued Schliebs “Some major manufacturers are also implementing the system even further downstream, from their extruder to their coating system and through to their packing line. Here is a system that they can go with all the way – an end-to-end package solution that fits perfectly from a cleaning perspective and from an enclosed system point of view, and the risk is absolutely minimal from a contamination or hygiene issue.” Because of the flexibility of Cablevey’s tubular drag conveyor system to integrate with existing cereal production processes, coupled with the exemplary capability of this system to transport cereal product without damage or contamination, combined with ease-of-cleaning and quick changeovers, it significantly out-performs traditional conveyor systems in cost-efficiency and optimized product transport for cereal production. The tubular drag conveyor truly embodies a new generation of conveying solution for breakfast cereal processors. Cablevey Conveyors, a division of Intraco, Inc., is the leading manufacturer of tubular drag cable conveyors and material handling systems for whole bean coffee, pistachios, almonds and peanuts, cereal, beans, seed, snacks, and powder and bulk solids. Cablevey conveyors gently move through an enclosed tube without the use of air. Systems can convey up to 1,500 cubic feet per hour. Powders, chunks, flakes, pellets, prills, parts, shavings, crumbles, granules, fluff, regrind and dust can all be handled with ease. The company makes available numerous layouts using multiple inlets and outlets. Product separation and degradation are practically eliminated. Since 1971, thousands of Cablevey systems have been manufactured and installed in 49 states and 60 foreign countries.